William C. Brincefield | Consolidated Planning, Inc.
Bill Brincefield was born in Salisbury, NC and graduated from University of North Carolina-Charlotte in 1978, thanks to the G.I. Bill and his fulltime job at the Y.M.C.A. 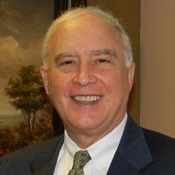 Shortly after graduating, Bill joined Rick Dobson in the creation of C. Richard Dobson and Associates, which would become Consolidated Planning, Inc. in August of 1981. Bill has been a financial professional for well over 30 years. He is a specialist in financial planning, estate planning, and business planning. Bill Brincefield was very active in the Mecklenburg County Boy Scouts when his boys were younger, and is still an active member and supporter of the Y.M.C.A. Bill has been married to Lydia Brincefield since 1970 and they have three wonderful children..Andy, Neal, and Sallie.